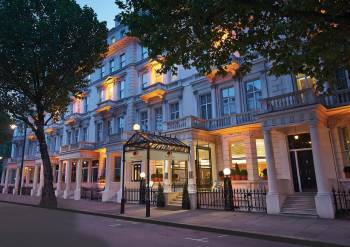 Boasting a prime location in the heart of the Kensington area, DoubleTree by Hilton London – Kensington is just a short walk from the most famous city museums – Natural History Museum, Victoria & Albert Museum and the Science Museum. After a day of exploring London’s attractions, head back to the comfort of our historic hotel where regency-style façade combines with contemporary interior and modern amenities. Enjoy a relaxing evening with traditional English dishes and International specialties at The Regency Restaurant, or unwind with an aperitif at 100 Queen’s Gate Bar & Lounge. 24-hour room service is available for guests who would like to dine in the privacy of their rooms. This DoubleTree by Hilton property offers 203 rooms and suites, each with the feel of home. However, with its separate living room and quiet city views, the stylish two-level duplex suite is a touch of luxury and the true hospitality highlight. For your business needs we have an on-site business center and eight flexible function rooms for up to 100 attendees. Planning events is one of the things we do best at DoubleTree. Whether you invite friends, colleagues, or clients to an event at DoubleTree, we’ll make sure that everything will run smoothly. We’re ready to help: setting up your space, supplying the room with what you need, or meeting special dietary needs, we’ll make sure the details are dialed in. We’d love to give you a tour and show you some of the ways we’ll help you make your next event the best ever. Check on availability with us today.